Zonally anomalous net precipitation, P* – E*, is the difference between the full net precipitation and the zonal mean (denoted by [ ]), where ( )* = ( ) – [ ]. Large positive values of P* – E* indicate anomalously wet regions such as the Asian monsoon regions, the Pacific ITCZ, and the Northern Hemisphere storm tracks; large negative values of P* – E* indicate anomalously dry regions such as the subtropical lows, the Mediterranean, and the Boreal forests (Fig. 1). The change in P* – E* over the next century, as modeled by 23 state-of-the-art climate models forced with continued greenhouse gas emissions throughout the century, is substantial in many regions. Figure 1: (top) The modeled climatology of annual-mean P* – E* in the recent past (1976-2005) and (middle) change by the end of the next century (2070-2099), averaged over 23 CMIP5 climate models using the RCP8.5 emission scenario. (bottom) The simple thermodynamic (or “wet gets wetter”) scaling gives the expectation from an increase in atmospheric moisture content with fixed circulations. It predicts the wrong sign over much of the tropics and subtropics. A comparison of this “wet gets wetter” or simple thermodynamic scaling to the actual change (Fig. 1) reveals many regions where the sign of change is opposite of the thermodynamic prediction (1/3 of the globe in total). Especially in the tropical oceans, there are large regions where zonally anomalous wet regions get drier and zonally anomalous dry regions get wetter. 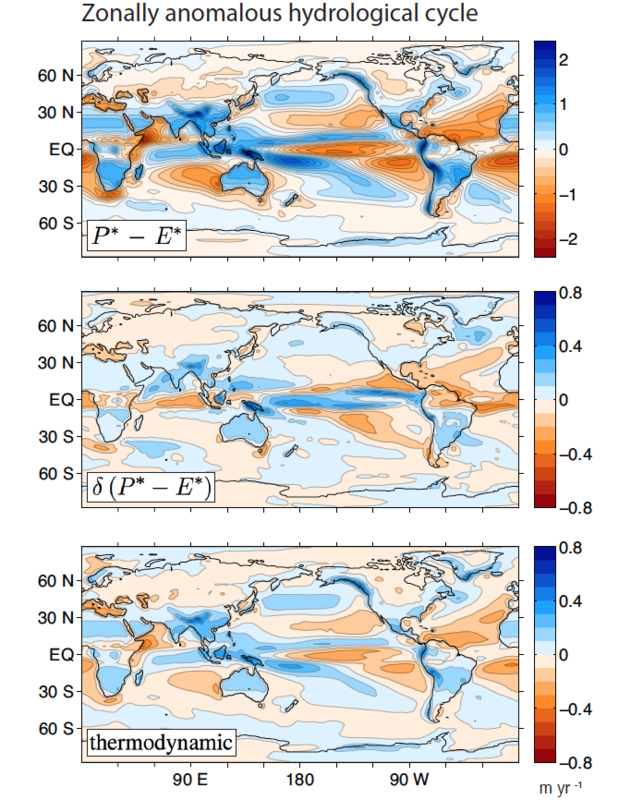 This lies in contrast to changes in zonal-mean P – E, where the “wet gets wetter” idea explains the modeled drying of the subtropics and wetting of the tropics and midlatitudes with global warming. Dynamic changes, that is, changes in stationary-eddy circulations, are strongly correlated with the full P* – E* change (Fig. 2). Transient-eddy changes are also important in the midlatitudes (beyond 30 degrees latitude). Figure 2: Zonal correlations of moisture budget changes with δ(P* − E*): thermodynamic, dynamic, and transient-eddy components based on the moisture budget decomposition (solid lines) as well as approximations to the thermodynamic and dynamic components (dashed lines). This simple approximation captures most of the modeled P* – E* change. The importance of stationary-eddy vertical motions at 850 hPa arises as vertical motions bring moisture from the boundary layer to a mean condensation height of about 850 hPa (Wills and Schneider 2015). The zonal variance of P – E is unaffected by circulation shifts, and may still increase with the increase in atmospheric moisture content. Indeed, we find that the zonal variance increases at all latitudes over the next century (Fig. 3). However, this increase is less than would be expected from a simple thermodynamic estimate (blue dashed line), obtained by computing the variance of the simple thermodynamic scaling. Figure 3: Change in root zonal variance of P − E versus latitude and thermodynamic estimates of the change. Grey shading gives the model spread in the change, as quantified by the interquartile range. The implied dynamic term shows the difference between the mean thermodynamic term and the actual change. Just as for the change in P* – E*, we can split the change in zonal P – E variance into thermodynamic, dynamic, and transient-eddy components. The thermodynamic term based on the moisture budget decomposition dramatically overestimates the change in zonal variance in the tropics and subtropics, but gets the change approximately right at higher latitudes (Fig 3). The total implied dynamic change, which results from stationary-eddy circulation changes and transient-eddy moisture flux changes, is negative at most latitudes. Our paper goes on to show that this is primarily a result of the reduced strength of stationary-eddy overturning circulations, such as the Walker circulation. The reduction of stationary-eddy vertical velocities limits the increase in strength of the zonally anomalous hydrological cycle that would otherwise result from the increased atmospheric moisture content with warming. The increase in zonal variance of P – E means that regions that are wetter than the zonal mean will get wetter on average and that regions that are drier than the zonal mean will get drier on average. However, the decreasing strength of stationary-eddy circulations means that these changes are smaller on average than would be expected from the “wet gets wetter, dry gets drier” mechanism.